Are you bit tired of your old kitchen? You don’t have to spend a fortune to give it a fresh new look! All it takes is a little time, effort & creativity to zest up the heart of your home! Modernize your kitchen with the new kitchen trends by showcasing creative uses of colours, modern appliances, & functional design, as there are endless ways to bring your kitchen into the present kitchen trends to look stylish & comfort. Whether you are trying to sell your home, or even if you plan to stay in your space for generations to come, these ideas can help you transform your kitchen into the cooking space of your dreams! Here are the 13 creative ways to make your dull & outdated kitchen in to a modern style kitchen & make it feel new – inviting & exciting once again! Outdated kitchens might have been made with materials that were popular decades ago, including metals used for kitchen cabinet hardware. With the manufacturer’s releasing innovative materials & trending designs, it’s time to rethink your drawer pulls & lighting fixtures. Metals that trend includes matte aluminium, stainless steel, brushed gold, & copper. You can try these materials in your kitchen cabinet hardware, range hood options & pendant lighting! Flooring is an area of your kitchen that is often forgotten, & yet plays the major role in your entire kitchen. If your flooring is keeping you in the past, then try to switch from your traditional rolled vinyl or linoleum flooring to a more resilient, timeless material like wood, tile, or stone! These materials will last longer as well as boost the value of your house & modernize your kitchen apart from look, comfort & safety! 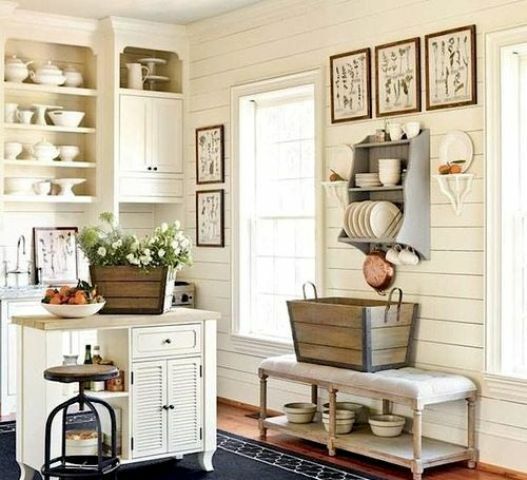 Many old kitchens were built to include walls & wall upper cabinetry to house the dishes & cookware. Often, these overhead cabinets consume the eye & make the kitchen feel crowded. You can open up space by removing the upper kitchen cabinets that free-up the wall, allowing the modern style kitchen with open shelving for dishware & few kitchen decor items! If glass door fronts are out of the budget & still you want to open up a bit of space, try simply removing the doors to your upper kitchen cabinets. It’s an easy change to make (just unscrew the doors and fill and paint the holes) that can add a sense of spaciousness to a small kitchen. It’s amazing how much we accumulate storage over the years. You should try sorting out your kitchen cupboards & organize them, so you have access to the things you need for use every day. Clearing your worktops can also instantly improve your kitchen & it won’t cost you anything at all! You can also try rethinking your storage solutions by adding Pull-out drawers in a cupboard which instantly make every spare inch of space usable! The old or outdated kitchens may have the inconvenient tile & grout or cheap vinyl for workspace. There are endless variety of countertops available in the market so you can update your countertop from solid surfacing varieties that consist of resin & polymers to natural stone varieties such as marble & granite. Remember, there’s an option for everyone for their style & budget. Over the last few years, the designers are becoming increasingly creative & are using the heavy duty structural materials for the countertops. So you can also add concrete, brick, tile, to your modern kitchen list! The kitchen is most likely the busiest area of your home, & the place where people are most likely to gather together! The modern kitchens embrace this by adding seating to the kitchen. Whether you choose the countertop stools at a breakfast bar, or you opt for a bench at a window side table, depending upon the space availability. Seating can give your kitchen the new appeal! In busy families sometimes mother can attend friends & take care of children doing homework while cooking. Therefore seating become essential in your modern kitchen. New modern kitchen appliances can refresh your kitchen without changing any of the furniture. You’ll need to ensure that they will fit into the existing space, though, freestanding appliances can be replaced more easily. You can also consider upgrading to energy efficient models to save on electricity by adding modern kitchen appliances to your kitchen! Consider replacing your plumbing fixtures as well, as the low-flow kitchen faucets save a lot of water! Updating your kitchen shouldn’t only be for the aesthetics; it should also help save you money & the Earth’s resources i.e. water & energy! Painting your kitchen’s existing cabinetry is a great option for homeowners when you have a low budget! You could choose a vibrant & dark colour finish to cover up the outdated wood & unclean kitchen cabinets. Once you have modernize your kitchen all the major components, don’t forget the lighting! Kitchen lighting sometimes be an afterthought, but it is essential for the safety, ambience, & versatility of your kitchen. If your kitchen solely contains one overhead ambient lighting fixture, look into recessed lighting for a modern illumination source. You can also give your modern kitchen a unique sophistication by using an entire wall of framed & lighted art. You can also add pendant lighting over a kitchen island. Using lighting under the kitchen cabinet to illuminate the countertops is a great option for modern kitchen trends! While you may not think about it, your kitchen is a great place to add decorative elements that bring your lifestyle into your kitchen. For many homeowners, adding shelves on top of cabinets allow room for artwork, plants & other decorative items to add unique kitchen decor! Built-in display shelves below your kitchen island can showcase your kitchenware, your favourite cookbooks, vase of flowers, bowls & many more can make your kitchen more lively. The simplest way to bring change in your kitchen is to refresh or update your fabrics used in chair coverings, curtains/blinds, tablecloths all of which can work wonder & are cost minimal! Open shelving is a great opportunity to practice the art of display. Rather than hiding your dinnerware inside the cabinets, you can display them on a pretty rack on your counter for all to admire! Hope above given ideas will initially help you to thought & modernize your kitchen by planning unique makeovers! Comment here if you like it!